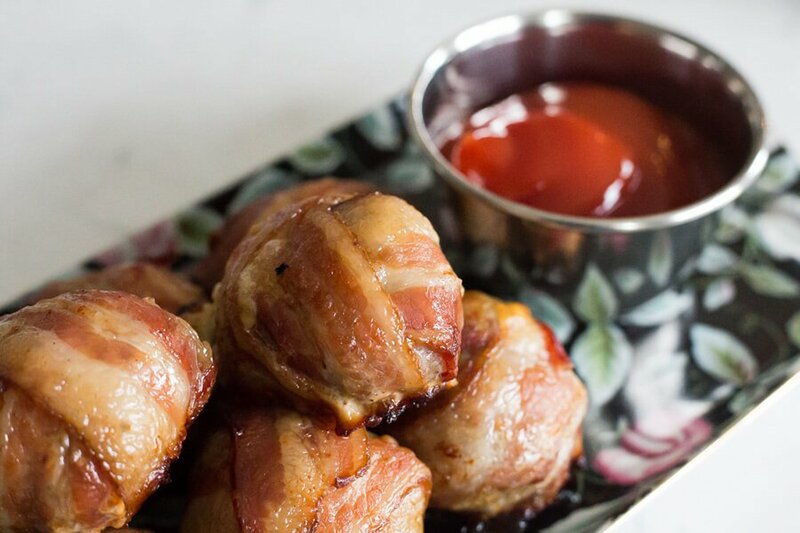 Up your fat intake with these delicious Keto Bacon Burger Bombs. How exciting are these! Here is a quick and easy snack or add-on to your next meal with this cheese-stuffed sausage or beef rolls wrapped in bacon. The best thing about these burger bombs is that they only require 3 main ingredients. You heard that right… 3. Use raw sausage rounds for this recipe, or roll some beef. While these are super simple, it does take about an hour in the oven for the bacon to become crispy – so plan ahead! I happen to like the beef version. Whichever you choose this recipe is sure to please! Yields 12 servings of bacon bombs. Each serving comes out to be 217.17 Calories, 20.31g Fat, 1.37g Net Carbs, and 14.38g Protein. Preheat the oven to 350 degrees F. Lay out your sausage rounds onto a cookie sheet lined with parchment paper. Dust your sausage with cumin, onion powder, salt, and pepper. Place a piece of cheese into the center of the sausage and roll into a ball. Bake and 350-degrees f for 1 hour. Enjoy! My name is Len Benoit and I’m the owner/trainer at Fit 1 in Toronto/Etobicoke. I didn’t invent this delicious #WhatscookinWednesday Keto Bacon Burger Bombs, I spied it on ruledme.com, but I will enjoy it right along with the rest of you. If you are looking for gyms in Etobicoke or Toronto and want more information about my Women’s and Co-Ed Bootcamp, Youth Sportfit Program, or Personal Training classes, give me a call at 647-776-7776 or visit the website at www.fit1bootcamp.com. Come in for a FREE 7-Day Trial membership if you are friends with one of our members, if not, head on over to the website to learn more about our 28 Day Quick Start Challenge and find out why FIT is right for you!